There is overwhelming evidence that over the last 20 years or so, trade integration with low-wage manufacturing countries like China has had dramatic effects on the manufacturing landscape in rich countries like the US and Germany (Autor et al. 2013, Dauth et al. 2014, Pierce and Schott 2016, Limao and Handley 2017). It appears that this growing trade exposure is also in part to blame for growing political polarisation and increasing support for populist and protectionist parties. A recent body of papers has quite convincingly shown that the same type of trade shocks that have impacted regional (sub-national) manufacturing employment have also had regional effects on voting, or on politician behaviour along those lines (Malgouyres 2014, Feigenbaum and Hall 2015, Autor et al. 2016, Jensen et al. 2016; Che et al. 2016). In our own work, we documented that in Germany from 1987 to 2009, growing import competition from Eastern Europe and China has increased voting for extreme far-right parties, while export access to the same countries has reduced it (Dippel et al. 2015). While it is perfectly reasonable to assume a causal mechanism by which trade integration changes voting behaviour because it impacts voters’ labour market situation, it is very difficult to convincingly establish this causal mechanism. This empirical challenge is by no means unique to the nexus of trade, labour markets, and voting. Applied economic research has made huge advances in estimating causal effects of a single variable on a single outcome, such as the causal effects of import competition on either labour market outcomes or voting. By contrast, causal mechanisms are often still a ‘black box’. We typically have far fewer ‘natural experiments’ or exogenously varying explanatory variables than we have potential outcomes to be explained. As a result, researchers often generate a large number of stand-alone causal effects of one variable on a number of outcomes with relatively little to say about possible causal links between these outcomes. To illustrate, the same types of regional trade shocks have been used to estimate the effect of import competition on (i) manufacturing employment, (ii) social transfers, (iii) wages, (iv) legislative behaviour, (v) voting, (vi) crime, (vii) marriage markets, and (viii) patenting. In some cases, this is fine. Import competition may increase crime and reduce patenting, but the additional crimes are probably not being committed by laid-off inventors, and crime is not preventing researchers from inventing. In other words, there is no causal mechanisms linking these two outcomes. But in other cases, this is a problem. If import competition has negative labour market consequences and makes voters turn to extreme or populist parties, then there likely is a causal mechanism linking these two outcomes of trade, and it is important for policymakers to know to what extent the latter effect is explained by the former. The search for causal mechanisms is called causal mediation analysis. Existing methods falling under this umbrella aim for the statistical identification of causal mechanisms, but achieve this only if very specific assumptions hold. The most important one is that the explanatory variable has to vary exogenously, i.e. effectively assuming the conditions of a randomised control trial. To illustrate, suppose we had a dataset of college seniors and in it we could observe (a) whether students attended a job interview training workshop, (b) students’ dress code at a subsequent job fair, and (c) whether they secured a job offer. Suppose we wanted to ask to what extent the workshop helped with getting a job because it advised students to dress more professionally. Existing causal mediation frameworks can answer this question only under the assumption that workshop attendance was randomly assigned. A second important restriction of existing frameworks is that they do not allow the explanatory variable to have any unobserved effects that also affect the observed mechanism. In the college example, this assumes away any effect the workshop may have had on an unobserved outcome – for example, a more serious attitude – that might influence students’ dress code and also directly affect their chances of securing a job through better interview skills. Unfortunately, many interesting data do not vary exogenously. For example, students probably attend job interview training workshops deliberately and not randomly. The most common solution to this problem is to find some other source of exogenous variation that partly drives the variation one is really interested in. For example, perhaps the student union accidentally advertised the workshop in some dormitories and not others. This exogenous/accidental variation can serve as an instrumental variable (IV) for workshop participation. A large portion of all applied economics research in non-experimental data – including the entire agenda on regional trade shocks – relies on IV. Consider Figure 1.1 It says that T (e.g. trade exposure) causes M (e.g. observed labour market outcomes) and additionally causes Y (e.g. voting responses) both through M and through other unobserved channels U. T is endogenous because there is an omitted/unobserved confounding variable V that changes T as well as M and Y. Fortunately, there is an instrumental variable Z that causes T and that is exogenous to M and Y in the sense that it affects them only through T and is uncorrelated with the omitted confounder V.2 Researchers interested in the causal effect of T on M and researchers interested in the causal effect of T on Y separately and correctly identify these by instrumenting T with Z. However, the present empirical tool kit offers no way of knowing to what extent the causal effect of T on Y is explained by the causal effect of T on M. This situation is exactly that of the two literatures cited at the beginning of this article. In a new paper, we show that certain constellations of the error term V do allow us to answer the question “what percent of the causal effect of T on Y is explained by the causal effect of T on M?” (Dippel et al. 2017). Importantly, this can be achieved with only the same single instrument Z as before. Requiring only one instrument is critical because many empirical research settings have only a single instrument that is truly compelling, making methods that require multiple instruments less appealing. Specifically, we can identify causal mechanisms when the confounders take the form depicted in Figure 2. Despite having one more unobserved confounder, the causal model underlying Figure 2 is less general than that underlying Figure 1 because it imposes a more specific structure. Figure 2 allows for an omitted confounder VT that causes T and M, and for a separate confounder VY that causes M and Y, but not for a confounder that directly causes T and Y. In some applications, this assumption is not appealing. For example, in the college example given earlier, it seems unreasonable to assume that there are no unobserved traits that make a student simultaneously more likely to attend an interview workshop (T), and directly more successful at securing a job (Y). However, in other applications, such as that of trade exposure’s effects on labour markets and voting, this assumption seems very reasonable. For instance, while secular productivity decline (a good candidate for VT) may make a region’s products get replaced by imports (T) and cause that region’s manufacturing employment to fall (M), it is unlikely to affect voting directly (i.e. other than through labour markets). Similarly, while an exogenous rise in nationalistic or xenophobic attitudes (a good candidate for VY) may impact populist voting (Y) as well as labour market outcomes, it is not likely to directly affect a region’s trade exposure. 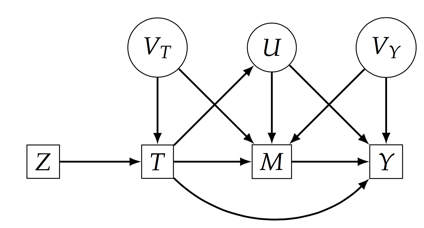 Having identified the assumptions about causal relations that allow for the identification of causal mechanisms, we develop a simple method to estimate the system through a series of three IV estimations. Applying this method to our question immediately highlights its usefulness by delivering a surprising finding. We find that 170% of the total effect of trade exposure on populist voting is explained by labour markets. What this means is simply that trade exposure’s other effects on voting, i.e. those that do not run through labour markets, are in fact politically moderating. (We have not yet rigorously explored why this is the case, but suspect that it has to do with increased cross-border coordination and work in international teams to manage globally fragmented supply chains). This is an important finding in the current policy debate. First, it implies that the negative labour market consequences of import competition from low-wage manufacturing countries have been even more consequential at the ballot booth than one might have thought. Second, it implies that trade integration can be a force for political moderation if we can cushion its negative labour market effects. Autor, D, D Dorn, and G Hanson (2013), “The China Syndrome: Local Labor Market Effects of Import Competition in the United States,” American Economic Review, 103, 2121–68. Autor, D, D Dorn, G Hanson, And K Majlesi (2016), “Importing Political Polarization? The Electoral Consequences of Rising Trade Exposure,” NBER Working Paper. Che, Y, Y Lu, J R Pierce, P K Schott, and Z Tao (2016), “Does Trade Liberalization with China Influence US Elections?” Technical report, NBER. Dauth, W, S Findeisen, and J Suedekum (2014), “The Rise of the East and the Far East: German Labor Markets and Trade Integration,” Journal of European Economic Association, 12, 1643– 1675. Dippel, C, R Gold, and S Heblich (2015), “Globalization and its (Dis-) Content: Trade Shocks and Voting Behavior,” NBER Working Paper. Dippel, C, R Gold, S Heblich, and R Pinto (2017), “Instrumental Variables and Causal Mechanisms: Unpacking the Effect of Trade on Workers and Voters,” NBER Working Paper No.23209. Feigenbaum, J J, and A B Hall (2015), “How Legislators Respond to Localized Economic Shocks: Evidence from Chinese Import Competition,” Journal of Politics, 77, 1012–30. Jensen, J B, D P Quinn, and S Weymouth (2016), “Winners and Losers in International Trade: The Effects on US Presidential Voting,” Technical report, NBER. Limao, N, and K Handley (forthcoming), “Policy Uncertainty, Trade and Welfare: Theory and Evidence for China and the U.S.”, American Economic Review. Malgouyres, C (2014), “The Impact of Exposure to Low-Wage Country Competition on Votes for the Far-Right: Evidence from French Presidential Elections,” working paper. Pierce, J R, and P K Schott (2016), “The Surprisingly Swift Decline of US Manufacturing Employment,” American Economic Review, 106, 1632–62. Figures 1 and 2 are so-called Directed Acyclical Graphs (DAG), which are graphical representations of a systems of causal equations. 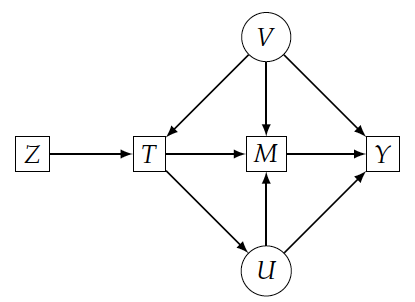 Variables that share a direct causal relation are connected by (uni-directional) arrows. Observed variables are boxed, unobserved variables are circled. A discussion of what Z is in this context goes beyond the scope of this article and is not critical here.